I read this for one of my criminal justice classes. It wasn’t the best reading, I’ll admit, but probably one of the easiest reads I’ve ever had for a class. 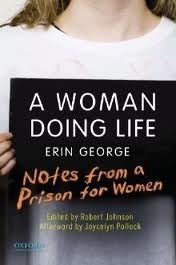 The author is the woman who’s in prison for life. She was found guilty of killing her husband but according to her all of the evidence was circumstantial and she claims that she had nothing to do with it. She seems believable, but I wish she would have gone into more detail about his murder and what happened leading up to it. Instead it’s all about her life behind bars, her time with her children and parents when the come to visit, and her interactions with fellow inmates. So, would I recommend this book, probably not. But if you find yourself needing a book for a school report or something similar, then I would say to go with this one because it’s short and fairly entertaining. If you do pick this book up, there’s a very interesting prison “cookbook” in the back. I swear reading the concoctions they’ve come up with using things they can buy from the commissary will make your stomach turn, but I guess when you’re desperate you do what you have to do. As if I don’t have enough to do with full-time work and school I’ve now decided to join a book club. If you’re interested you can find the link to the book club on facebook here. The cool thing about this book club is that all the ones they pick to read are offered for free download on Kindle through amazon.com. So, at least if I get too busy or don’t like the book they chose that month, I’m truly out nothing. This is my first month so I don’t know what this club normally does, but this month they chose three books, a classic, a modern, and a book of Irish poems (for St. Patty’s day I assume). You can choose to read as many of them as you want and you only post what you want to. There don’t seem to be any prompt questions. So far I like it! The first book we’re reading, the one I chose anyway, is the modern one called Protector by Laurel Dewey. I’ve made it through the first nine chapters just today and it’s actually really good! I’ve found that there are actually a lot of really good books that are offered for free when they first come out so that it sparks an interest. Once they get moved up onto the best sellers list they start charging for them because people will see that it’s on the list and that it has good reviews. But, they aren’t free forever so you have to jump at the opportunity if you’re interested at all. I currently have over 200 free books on my kindle waiting to be read. Some of them will probably never get read and I’m ok with that. If I pay for a book though I always make it a point to read it because I feel like I should. The worst one I’ve ever paid for (on my kindle) was Confessions of a Shopaholic. I feel like I got ripped off and it was only .99 cents! Yeah, it was that bad, but I read the entire thing. So, if you’re looking for one more thing to do in your life and you like to read I would recommend checking out this book club!